In areas where municipal water is not available or where the groundwater is either sparce or unusable, water is often held in tanks called cisterns. 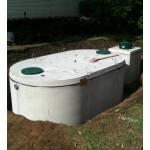 In areas where municipal water is not available or where the groundwater is either sparce or unusable, water is often held in tanks called cisterns. These may be made in various sizes with a variety of materials and located either above or below ground. In Ontario, where temperatures during the winter remain below zero degrees centigrade (32 deg. F) for extended periods, most cisterns are located below ground. 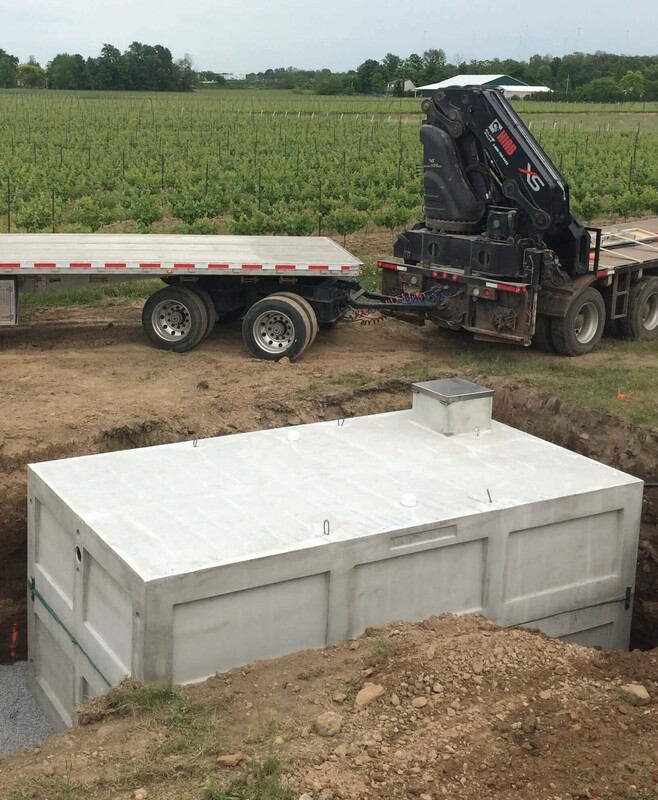 Concrete cisterns manufactured by Winona are designed to provide for the safe storage of potable water below ground in a strong and durable containment vessel. Access into our cisterns for either filling or cleaning is via a 20" I.D. square cast-in-place concrete riser with a 6" plastic fill pipe & cap. Our 'Safe Water' configuration includes a stainless steel lockable and drip-proof riser cover. This protects the contents from contaminants and allows for only authorized access. WCP can also supply low-water alarms, pumps, pipe and fittings to complete the entire water system. Cisterns may be configured for use of either high performance submersibles or in-the-house jet pumps. -Strong, durable watertight precast concrete construction. -Oval design with minimum flat wall components yields high inherent strength. -'Safe-Water' configuration includes Stainless Steel, Hinged, Lockable Drip-Proof access riser cover. -Brass pipe fittings cast into side wall and brass fittings installed on outside of wall for connection to flexible piping. Brass foot valve with sch 40 PVC pipe & fittings installed inside tank. (note...use of galvanized steel riser cover or galvanized fittings inside tank not recommended as they may leach toxic compounds into the water). -Potable PVC gasketed fittings for water-filling are cast-in-place on top of tank surface (patched-up connections through holes or knockouts in the concrete are not recommended as they may not maintain a watertight seal, thus allowing pollutants into the cistern). -Plastic coated safety steps installed for entry/exit. -1-1/4" PVC conduit couplings cast into access riser to facilitate routing of pump or alarm wiring. This eliminates the need for drilling holes into tank (which could compromise water tightness).